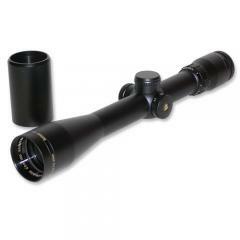 Bushnell 652164M Elite 6500 2.5-16x42 Multi-X Reticle Riflescope with Rainguard 652164MD FREE SHIPPING! The Bushnell Elite 6500 2.5-16x42 is part of their flagship line of premium riflescopes, and armed with the most advanced optics available. Each lens surface comes with an individually calibrated Ultra Wide Band Coating that maximizes light transmission for the clearest, brightest, most detailed image possible. The fingertip-adjustable turrets feature resettable zero to make sighting in quick and painless, and alongside the fine side focus control, they make inch-perfect shot placement easy. The durable hammer-forged aluminum tube resists recoil effectively, and features an argon fill for complete waterproofing. The sunshade keeps off glare, while the Rainguard HD coating on the exterior lens surfaces breaks up water droplets to reduce light scattering, maintaining full visibility in all weather conditions. ©2002-2019 CopsPlus.com: Bushnell 652164M Elite 6500 2.5-16x42 Multi-X Reticle Riflescope with Rainguard 652164MD FREE SHIPPING!